The forebrain is made of two cerebral hemispheres, left and right. The hemispheres are almost identical in shape, yet they function differently. Inputs from the right side of the body are usually transferred to the left hemisphere, and vice versa. The olfactory system and taste are exempt from this rule. Since, at the beginning, each hemisphere receives the inputs from a separate receiver on each side of the body, each develops a separate perception. Because the connection between two hemispheres takes year to develop and mature, the behavior of young children in some situations resembles that of split-brain adults. An infant who has one arm restrained will not reach across the midline to pick up a toy on the other side before the age of seventeen weeks. The baby cannot combine the two perceptions received from each side (Kalat 2003, 428). Besides, it seems that for the majority of people who are right handed, the left hemisphere is specialized to perform common tasks. For a long time, it was believed that the left hemisphere was doing the actual work, while the right hemisphere remained mostly dormant for ordinary people. The right hemisphere has been called the “subordinate” or “minor” hemisphere, and some have even referred to it as “illiterate” and “mentally retarded.” However, recently it is understood that each of the hemispheres has its own functions. 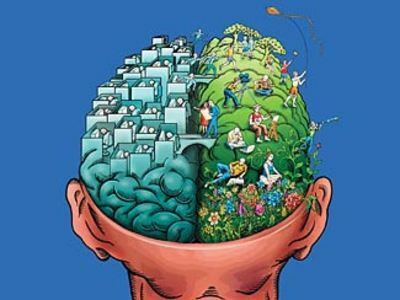 Most tasks require the cooperation of both hemispheres, although each uses its own percepts, mental images, and associations. In children, each brain half appears to have its own distinct cognitive domain with its own private perceptual, learning, and memory experiences, all of which are seemingly unaware of corresponding events in the other hemisphere. In adults, these two different perceptions combine to create one insight, although one can trace the two dissimilar perceptions in forming our awareness. It seems that the left hemisphere exerts a kind of dominance on the overall perception of the adult. However, before the corpus callosum (the main connection between hemispheres) matures at age five, children display the right hemisphere’s perception more frequently. The functions of the two hemispheres in adults are somehow mutual and complement each other. In isolated experiments, the same individual can be observed employing one of two distinct mental strategies, much as if the individual is two different people, depending on whether the left or right hemisphere is in use. However, in the normal state, the two hemispheres appear to work closely together as a unit; one does not remain “switched on” while the other idles (Sperry 1981). The two hemispheres’ insights, together, create our global perception. Only after damage to the corpus callosum (the main connection between two hemispheres) can we see clear evidence of lateralization. We usually distinguish the hemispheres by the traits each one is linked to—the head versus the heart, thoughts versus feelings, mind versus instinct, sensing versus intuition, and so on. Below, I will elaborate on these two different mental approaches. Let us differentiate between direct and simple perception of received sensory stimuli and fabricated perception based on manipulation and modification of incoming data. I am referring to the act of scanning undisturbed and unaltered data versus obtaining a perception by interpreting and legitimizing the received data. For the sake of argument, let us understand the right hemisphere as the scanner of the unaltered data and left hemisphere as the interferer and interpreter. However, in reality, the lateralization of brain functions is not so clear cut, and the borderlines overlap many times to carry out different brain functions. Often the right brain, or its different locations, performs or participates in functions normally attributed to the left hemisphere. Please note that I am assuming an idealized and simplistic viewpoint while describing hemispheric differences. In reality, brain tasks are complex undertakings carried out by a collaboration of the two hemispheres. Although not exactly correct, this viewpoint should not invalidate the main argument in this article, in which the act of forming a perception is compared with simple scanning. I will argue that these two different perceptions resemble the two aspects of physical reality—the classical and the quantum mechanical. The classical and quantum levels of reality seem alien to each other as well, although they are different sketches of the same objective reality. One might say that classical physics and quantum physics portray two different perceptions of the same realm. We cannot dispute the fact that the interpreter in the human brain has helped us reaching the heights of modern civilization and technological advances. However the perception it has created, namely the classical level of reality, may be just an approximation of a deeper reality which is partially presented by quantum mechanics . For more information, see Holder (n.d.). Split-brain patients are those who have had a commissurotomy to separate the main connection (the corpus callosum) between the two cerebral hemispheres for therapeutic reasons.